WHEEL CHOCKS - Auto Wheel Services, Inc.
With the new Fastway® ONEstep™ chock, you can throw away the chunk of wood or rock you’ve been using under your trailer. The ONEstep is the fastest and easiest tandem axle wheel chock available. To place the chock, simply slide it into place and step down. No bending or kneeling required. When you’re ready to go, just pull up on the cable handle, and the ONEstep chock pulls right out. The ONEstep chock is perfect for travel trailers, 5th wheels, boat, cargo, horse, farm, and utility trailers. Keep your trailer safe and secure with the ONEstep. • More comfortable set-up: sets and removes from a standing position, no more kneeling down. 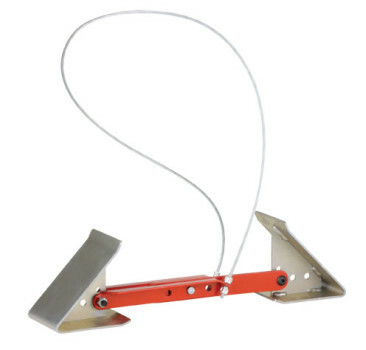 • Keeps your trailer firmly locked in place, reducing movement when you are in the trailer. • No more hunting around for heavy rocks when you get to your camping spot. • The highest amount of stability and security available. • Serrated texture on all sides offer extra "grip"
• High visibility reflective tape on three sides for improved visibility Weight 6.10 lbs. • Not for automotive or truck use. 7" x 7" x 9-1/2"